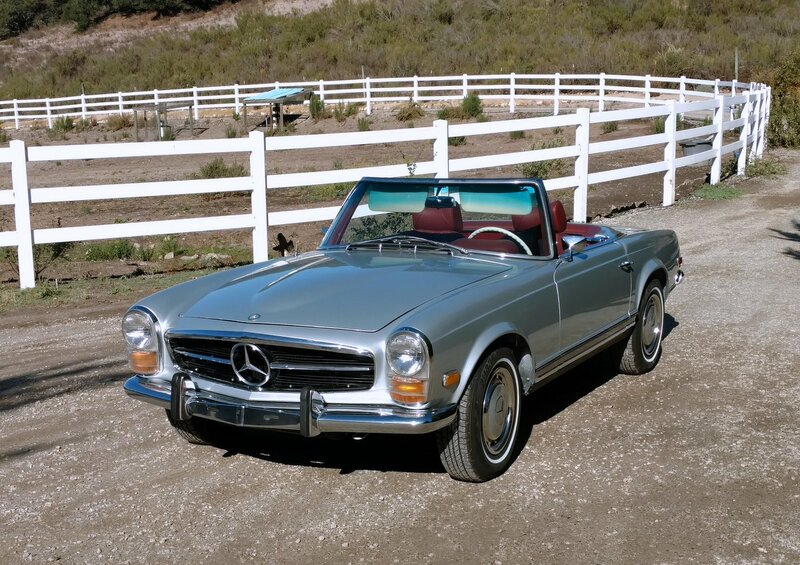 This factory silver 280SL is turn key ready for any Mercedes-Benz enthusiast or lover of the 113 Pagoda models with receipts totaling in excess of $25,000 since 2015. 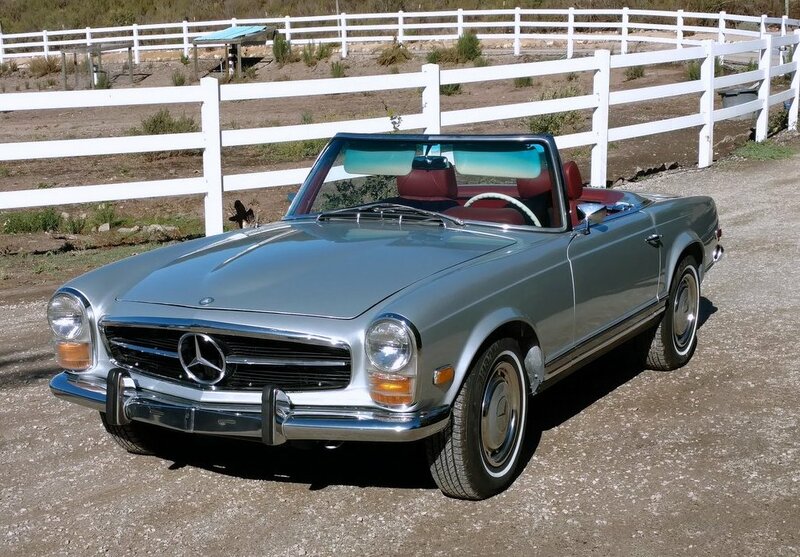 This factory silver 280SL Pagoda was purchased by the current owner from The Car Collection, LLC – a dealer in Miami, FL in January of 2015. According to the dealership, it was a 2-owner car from outside Dallas, TX which was further corroborated by the Texas license plate found in the trunk and a TX state registration sticker on the windshield. Upon purchase by the current owner, the car was inspected and deemed to have all original components, nice clean floors, and was very solid throughout. In 2015, after spending some time with the car, the owner elected to upgrade the car in nearly every area through an in depth restoration regime. The interior was completed in June of 2015 by K&H European Auto Upholstery in Garden Grove, CA. The original Black was replaced by Burgundy leather (not MB-Tex) with matching red loop carpeting. New seat pads and backs were also included in this interior upgrade rounding out a very clean and fresh interior finish. The original wood kit was refinished in Macassar Ebony (from original Rosewood) by Madera Concepts in Goleta, CA in March of 2015. The original black steering wheel was replaced by an Ivory wheel and ivory horn pad. Also added were ivory accents such as the shift knob, parking brake knob etc. Due to a scratch in the drivers side window, it was replaced with a factory tinted window from the Mercedes-Benz Classic Center (green tint glass as per the Data Card for this car). 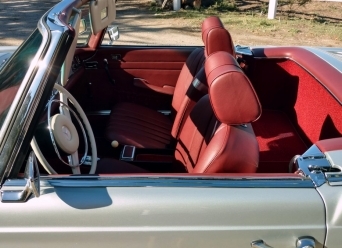 Original reconditioned Kangol seat belts were installed along with period correct head rests that were not stock on the 1968 280SL (they became available on the 69′ model). The Becker stereo system has been upgrade with enhanced modern speakers and ipod connectivity with very little compromise to the original look of the interior. For the exterior cosmetics, the body was taken off the frame, the engine bay was stripped and the car was given a full respray (not including the hard top) in 180G Silver. Engine parts were all cleaned, plated and/or coated and the engine bay was then re-assembled ending in the excellent engine bay cosmetics seen at present. The car was given new seals and sill mats as well as a new black canvas soft top/headliner from German Auto Tops. Correct front and rear bumper guards were added along with chrome exhaust tips purchased from the MB Classic Center. Work was done by SL Expertise in Glendale, CA. Mechanically, the car is in very good running condition with no current needs and is ready for daily driving. 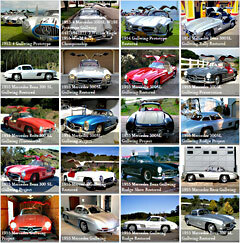 Maurice’s Mercedes in Costa Mesa, Ca did some minor tuning within the last year and the car is fully serviced. This 280SL is turn key ready as a very presentable driving example for any enthusiast or lover of the 113 Pagoda models. Car comes with receipts totaling in excess of $25,000 since 2015.